As expected, one of my favorite food groups to enjoy while home in Texas is steak. 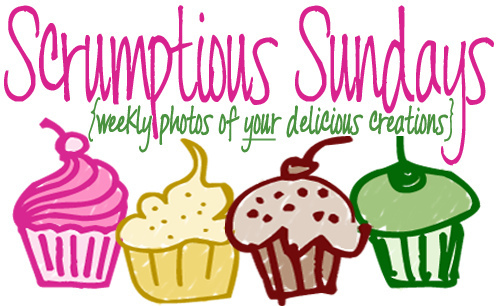 Yes, steak is a food group in Texas; as are Tex-Mex, cupcakes and bar-b-que. I have been to my fair share of fancy chop houses, Brazilian churrascarias, chain ‘road house’ establishments and local diners to enjoy the various cuts of meat that the state has to offer. At the end of the day, Poppop’s steak and twice baked potatoes will always be my favorite, but the Hoffbrau on 6th street is a notable runner up. Please do not confuse them with the other similarly named chain in Texas; they are not related. If you haven’t eaten off of weathered orange formica table tops in the heart of downtown Austin, then you haven’t been to the Original Hoffbrau Restaurant. They have been serving unbelievable grilled to order steak for almost 75 years. The chef fires up your choice of meat on the grill while his wife provides the charmingly grouchy service that we’ve all come to love. She’s sweet, just don’t ask for anything not on the menu. Guaranteed they don’t have it. The menu is simple, you start with a salad tossed in olive oil, garlic, green olives and tomatoes. A plate of sliced bread and saltine crackers are brought out too. Go ahead and eat the crackers if you must, but make sure you save the bread – you’ll need it later. 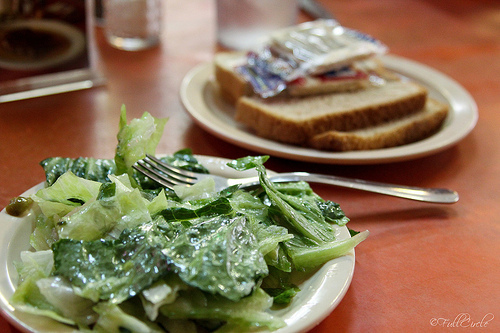 Oh, and please don’t be alarmed when your salad is plated out of a giant plastic trash bin – in all the years we’ve been dining there I haven’t seen it used for anything other than tossing salad. 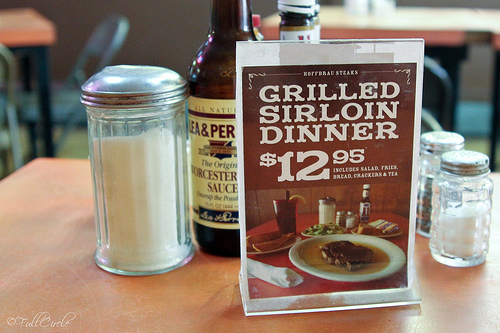 There are four cuts of steak offered – T-Bone, Top Sirloin, NY Strip, and Ribeye – and they serve until they run out. 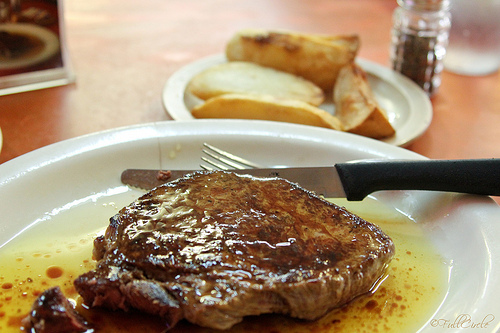 The steaks are seasoned to perfection and served smothered in melted butter alongside a plate of fried potato quarters. The potatoes are excellent at sopping up the extra butter and juice from your steak, but if you can’t quite get it all you’ve still got bread thanks to my previous warning. Not much has changed since I began eating at the Hoffbrau 20+ years ago and it’s not a far stretch to assume that not much has changed since they first opened in 1934. They went from a nickel beer joint serving cold cuts and saltines at the end of prohibition to a booming steak joint in the 1940’s as soldiers from Bergstrom came in with big appetites during WWII. Thanks to those soldiers, I am able to call one of Austin’s oldest steak houses a personal favorite. 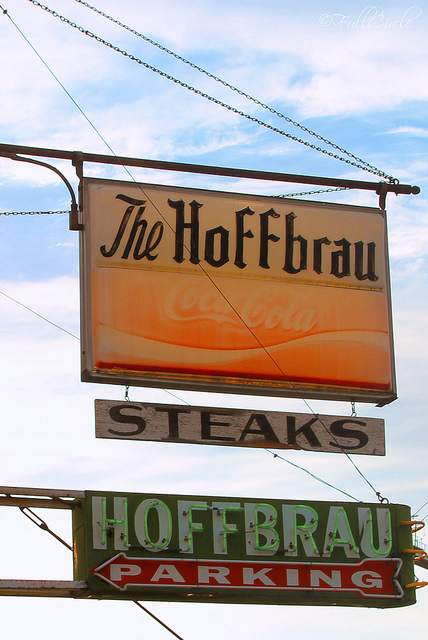 The Hoffbrau is still owned and operated by the original family. 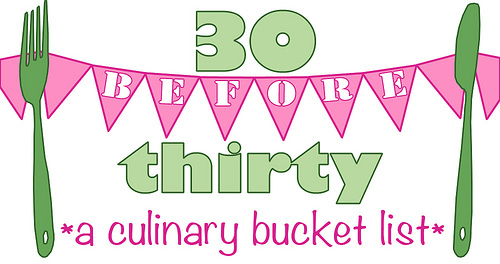 In fact, more than likely, the original owner’s granddaughter is your waitress and her husband is manning the grill. If you’re looking for an unbelievable, no frills, delicious steak dinner, ignore the Yelp reviews and stop by the Hoffbrau. And if the sight of all of that butter makes you queasy, ignore this post and head off to your local stuffy chop house. If you’re in Texas, it’s probably still going to be an excellent piece of meat.